Men’s Basketball sweep Cal State Dominguez Hills and Cal State Los Angeles. Women fall in overtime to Dominguez Hills, rally back against L.A. The UCSD women’s basketball team suffered a heartbreaking, 68–67 overtime loss Friday, Jan. 24 to Cal State Dominguez Hills during UCSD’s annual spirit night but bounced back quickly the following day to defeat Cal State Los Angeles 78¬–61. On Friday, the Triton women rallied to overcome what was at one point during the second half a 17-point deficit to Dominguez Hills, to force overtime play. In the first half, UCSD shot only 36 percent (9-for-25) from the field, but the Tritons made big plays in the clutch, shooting a stellar 61 percent (13-for-21) from the field throughout the second half. Midway through the second half, the Tritons went on a 22–5 run, crafting a slow but steady comeback against the Toros led by junior guard Miranda Seto (4–10 from the field) and junior forward McKennan Bertsch (8–11), both of whom scored 17 points apiece. After trailing, UCSD found themselves down two points with only 0.4 seconds left in regulation. With their last possession, junior guard Stephanie Yano inbounded the ball, finding senior guard Megan Perry who managed to sink a 10-foot jumper as the buzzer sounded to send the game into overtime. In extra time, however, the Tritons, who led throughout the first two minutes, let their momentum slip away, coming up short in the final minutes. “We had some people make some big plays, [but] down the stretch we just couldn’t make enough of them,” VanDerveer said. In spite of the devastating loss, the Tritons appeared to quickly shake off the previous night’s woes as they trounced Cal State Los Angeles the following day, scoring a season-high 78 points in the contest. The Tritons had four players score in double digits, with Perry leading the way with 16 points. Seto drained 13,while leading the team with seven rebounds and six assists. Senior forward Erin Dautremont also scored 13, and senior guard Rachel Marty finished with 11 points. After this weekend, the Tritons now hold an 11–5 overall record and are 8–4 in the California Collegiate Athletic Association, leaving them tied for third in the conference standings, dropping a spot from the previous week. 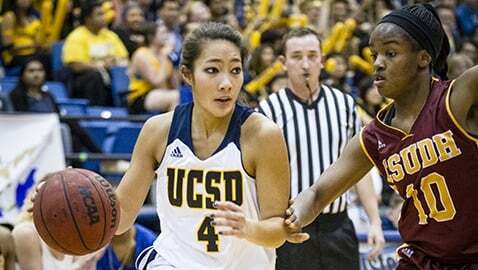 UCSD will next face Cal Poly Pomona on Friday, Jan. 31 and Humboldt State on Saturday, Feb. 1. While the Tritons are expected to beat ninth-ranked Humboldt State, their matchup against Cal Poly Pomona holds greater significance as the Broncos sit alone atop the CCAA. 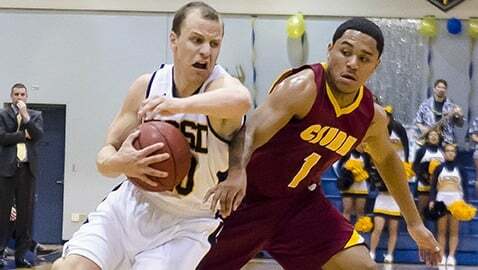 Both games will be played at RIMAC Arena, with tip-off slated for 5:30 p.m.
After losing twice on its road trip last week, the UCSD men’s basketball team returned to La Jolla, blowing out Cal State Dominguez Hills 80–59 on UCSD’s annual spirit night before beating Cal State Los Angeles 70–66. With the wins, the Tritons improve to 5–7 in the California Collegiate Athletic Association. The Tritons took to the court last weekend without the help of starting senior guard/forward MacKenzie McCullough and sophomore center/forward Zach McMillan — both out with injuries. Picking up the slack, redshirt freshman guard Aleks Lipovic had a career night in front of an energetic RIMAC crowd Friday, shooting an efficient 7-for-12 from three-point territory and scoring a career-high 23 points. But UCSD’s win was far from a one-man show. Freshman guard Adam Klie finished the night with 14 points, six rebounds and five assists, with a highlight “alley-oop” fastbreak dunk off a feed by senior captain James McCann that brought a crowd of 3,900 to its feet. McCann finished the night with 12 points and 10 assists, while sophomore guard/forward Hunter Walker also chipped in 12 points and six rebounds. On the other end of the court, the UCSD’s defense smothered the Dominguez attack, holding the Toros to only 39 percent from the field. Active hands-on defense was key in UCSD’s win, as the Tritons were able to score 21 points off of 14 Dominguez turnovers. The following night, UCSD would continue its winning streak, defeating Cal State Los Angeles 70–66, with sophomore forward Drew Dyer leading the way, grabbing seven boards, scoring 22 points — converting five of his 10 attempts from behind the arc. UCSD repeated its defensive performance from the night before, allowing Cal State Los Angeles to shoot only 28 percent from the field in the first half and coming up with a big, defensive stop to quell a 9–2 Golden Eagles run. “We had a couple huge plays in the defensive end down the stretch to allow us to get the ball back, make a few free throws and hold [Cal State Los Angeles] off,” Olen said to the UCSD Athletics Department. Freshman Klie earned his second straight start — replacing injured McCullough — and continued to impress. The freshman scored 15 points and nabbed six boards. McCann recorded his second consecutive double-double with 13 points, 10 assists and seven rebounds. McCann — a four-year starter for UCSD — now has 411 career assists, only four assists shy of becoming UCSD’s all-time leader. The Tritons have a tough week ahead of them as they continue their home stand next week when they face CCAA powerhouse Cal Poly Pomona (11–1) on Friday, Jan. 31 and Humboldt State (3–9) on Saturday, Feb. 1.